Of course, coffee cake. Bradley came home at lunch and asked why I had made a coffee cake. Why not? 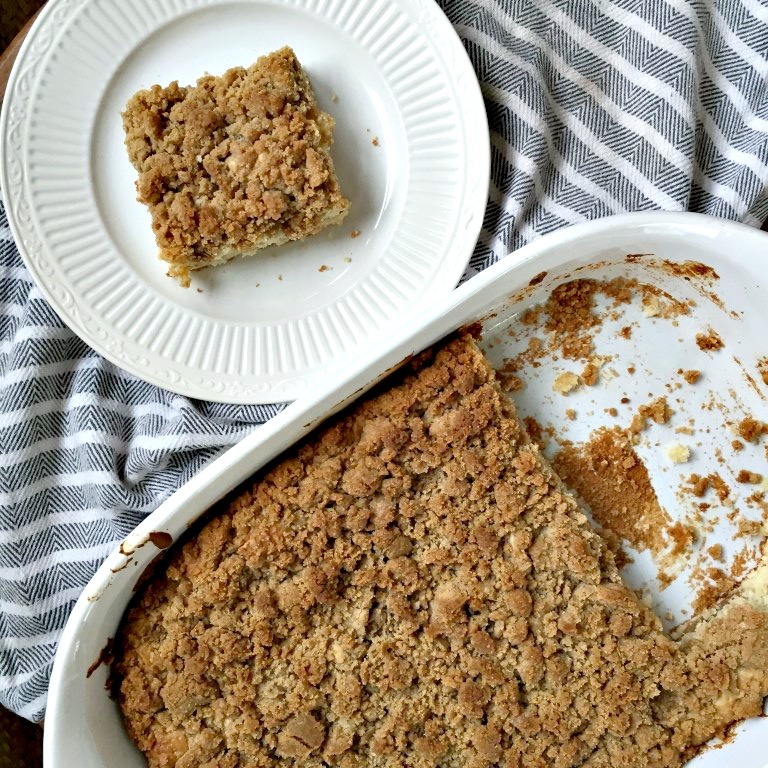 Everyone likes cake and when you’re trying to use up ingredients you have on hand, a homemade coffee cake seemed like the most obvious thing. Just make sure that ‘on hand’ you have three sticks of unsalted butter. A moist coffee cake is a must. A buttery-crumb-topped coffee cake is even better. This one is both. The quiche ended up being on the soggy side (the last time I will use a frozen crust) and even though I left out the baking soda that was called for in the coffee cake recipe (#iamlosingbraincellsconstantly), it was still delicious. Everyone was thrilled to have a huge slice of cake for dinner. Make the streusel topping: Mix together flour, 3/4 cup brown sugar, 1 teaspoon cinnamon, and 1 teaspoon salt. Cut in butter using a pastry cutter until small to medium clumps form. Set aside. Make the streusel center: Mix together the remaining 1/4 cup brown sugar and 1/4 teaspoon cinnamon. Preheat oven to 350 degrees. Grease the baking dish (or tube pan). Beat butter and granulated sugar until pale and fluffy. Beat in eggs and then vanilla. Mix dry ingredients together in small bowl. Beat in flour mixture in 3 additions, alternating with sour cream, beginning and ending with flour. Continue to beat until well combined. Spoon half of batter into bottom of pan and spread evenly. Sprinkle streusel center evenly over batter. Top with remaining batter. Sprinkle streusel topping evenly over the top. Bake until cake is golden brown and a toothpick inserted into the center comes out clean, about 50 minutes.